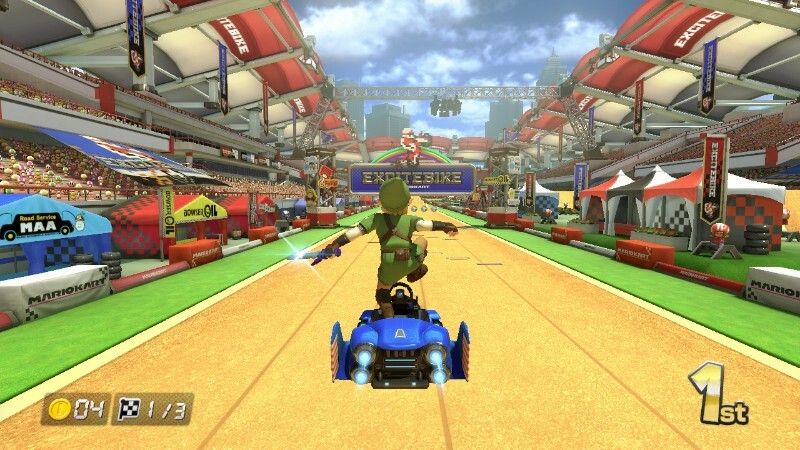 Yesterday saw the release of the first DLC Pack for Mario Kart 8. I had both packs pre-ordered from the moment we were allowed to purchase them and could not wait to get home from work and install the first pack. 2 new cup’s to compete for meaning 8 new tracks, with new characters and vehicles including Link as a playable character and the Blue Falcon as a new kart. EPIC! So first up, the Egg Cup! As it’d been a week or two since I last played MK, I opted to take both cups on first in 50cc mode just to get back to grips with the game. The first track in this cup is Yoshi’s circuit from the Gamecube version of Mario Kart. Having not played the Cube version of this game in years and not owning the DS version in which if featured again, this felt like a complete new track for me which was good. I did as expected find it tricky to negotiate the multiple relentless corners around Yoshi’s back part of the track, but after the 2nd lap it was back to the norm and found my way around it. Enjoyable track, but could be painful online if you mess up the multiple corner section and find yourself hitting the grass. Next up on the Egg Cup is Excitebike arena. Yes, THE Excitebike arena from the original NES game. It’s a very simple shape but mixes it up by adding multiple mud slicks on corners and grass patches behind jumps, so if you don’t get your path correct, you’ll crawl through the straights rather than speed through them. The highlight of the track though is the soundtrack for it. Great remix of the Excitebike theme and with the original NES Sprites on the big screen it just makes for an awesome nostalgic experience. We’re treated to our first new track and a track not based on an existing game (although if you’ve completed Super Mario Galaxy, you may second look at the dragon). The track itself is majority raced on the back of the dragon with lots of nice ancient Chinese architecture around. I found myself looking on the sides of the tracks at the amusing and entertaining pictures of Lakitu doing martial arts. A very fun track and a nice new track to the series. The final track off the Egg Cup is one of the ones I was most hyped to play. 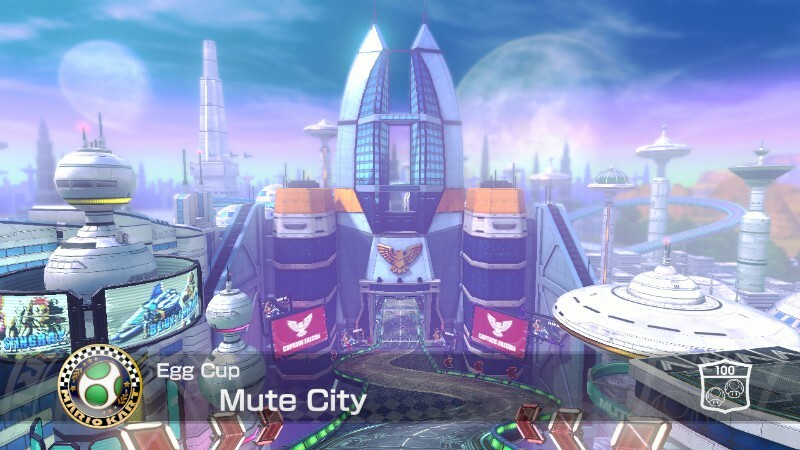 It’s Mute City from the Nintendo franchise F Zero. My goodness seeing this track made me realize how badly I would like to see an F Zero title brought to the Wii U. It’s been so long since GX and needs a new installment. But moving away from me game begging. The first thing I noticed was the absence of coins on this track. Instead paying homage to the game the track is based on, you drive over energy strips to increase your speed and multiple boost pads scattered along the way. As expected this track is almost all anti-gravity. It’s a frantic fast track that’s sure to be a favourite to the Nintendo die hard’s out there (Myself included). The next cup is the Triforce Cup. First track of this cup is Wario’s Goldmine which featured in the Wii version of Mario Kart. The first thing I took in when playing this game is how incredible this version of the track looks now on the Wii U compared to the past console. 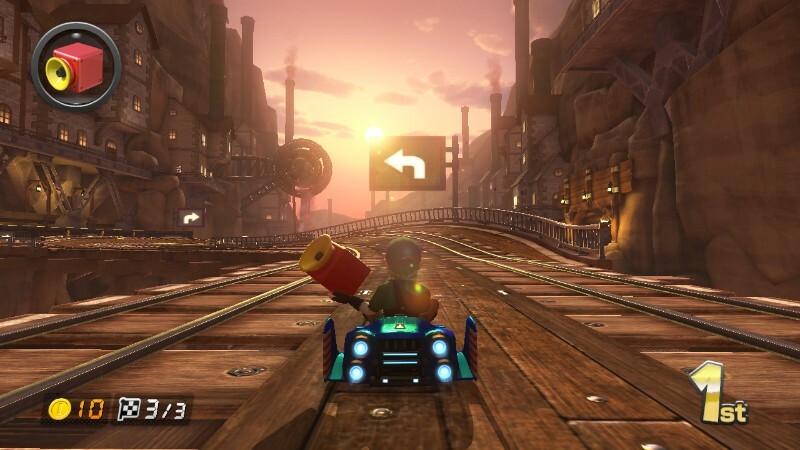 It’s stunning, one part of the track near the start where you see the sunset looks brilliant, and it’s a great showcase to just how powerful the Wii U really is. The track itself is pretty much the same, just lacking vertical sections and the mine carts now give you a speed boost if you bump into them. Another retro classic is up next. Rainbow Road. The only track to not contain any Anti-Gravity sections. it looks rather daunting initially, but after playing it a few times, you realize it’s a pretty simple track to pick up. The thwomps are glamoured up for the track but don’t really cause to many issues to avoid them. Not the best rainbow road in the game, but still fun all the same. The next track is another new one, Ice Ice Outpost. It’s two winding roads next to each other that loop across each other and cross paths with each other with an icy backdrop. I found this track to be the worst of the bunch. But the silly thing is, it’s not that bad a track either, it’s just the other tracks are so damn good and fun, this one just isn’t as good as them.However it still holds it’s own against the original tracks in terms of charm and fun. And the grand finale, the one we’d been waiting to play. Hyrule Circuit. From the moment you see the track in the pre-race intro you can tell this is going to be fun. Again the first thing that stood out to me was the soundtrack. Zelda theme remixed into a perfect style to fit into Mario Kart. Coins are out of this race too, but you’re collecting Rupees. I was enjoying this so much, and when you drive over an item, the classic chest opening noise from the Zelda games remixed as your item spins and is confirmed. So amazing and a great nod to the Zelda fans that’ll no doubt be playing this game. 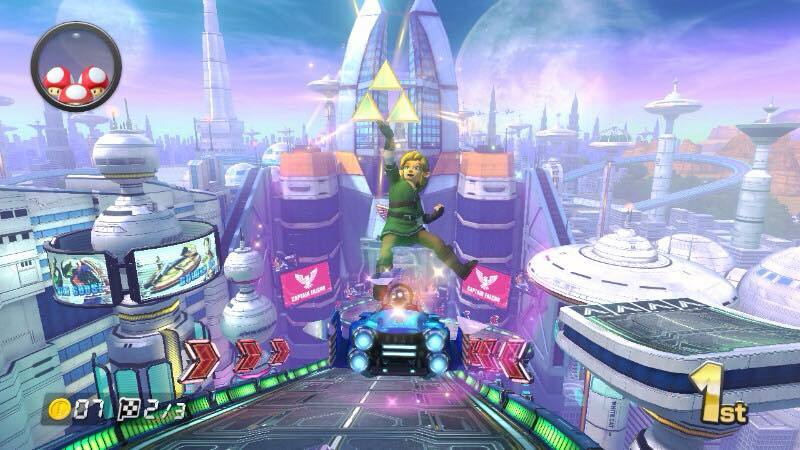 A nice nod to the Master Sword too features in the track. 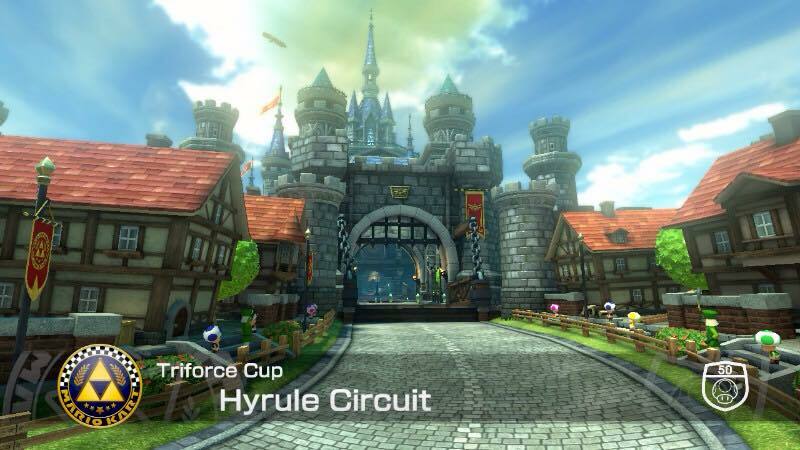 The track itself is another one that’ll be awesome fun on multiplayer. I found I hit the area the Master Sword is located in a few times initially, but eventually got the path I’d need and got comfortable with it. The value for money represented here is exceptional. I’ll no doubt be replaying these courses over and over trying to uncover more secrets or paths on them. 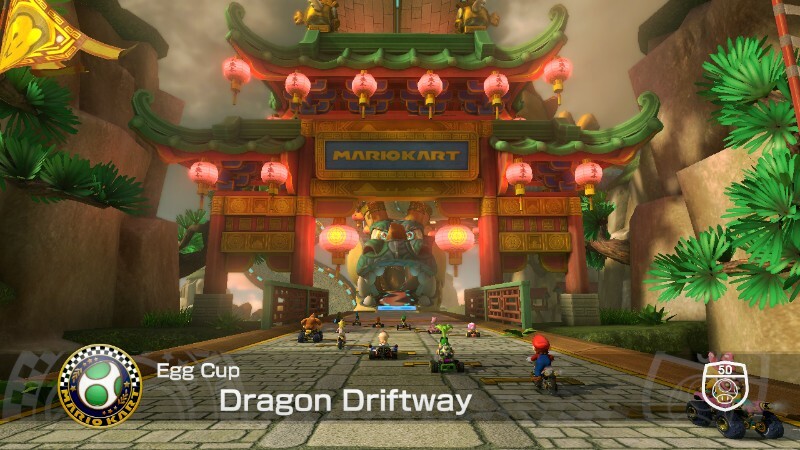 I have to say though I felt the Egg cup had better tracks which is surprising as I’d have thought Nintendo would have bumped the Triforce cup as the main cup from DLC 1. If like me and no doubt many other Nintendo fans that enjoyed this game immensely and continued to play it regularly, then you’ll not only love this DLC, you’ll need this DLC. It’s easily added hours more entertainment to a game that’s never felt boring in all the time I’ve played it since launch. It’s a long wait till May 2015 for DLC bundle 2, but if I could play the original with no DLC this long, I’m sure this DLC bundle would tie me and all of you over till DLC#2 comes out. One of the best value DLC packs available and a glowing example of what to expect from DLC and how it should be done.